Now that the NA & EU LCS Summer Split come to a finish and playoffs are right around the corner, we're back with another edition of This Week in eSports! Continue reading for LCS Summer Split standings following week 9, current standings for various regional leagues. team/player news, and more! Every week we track the regions leagues that will be directly seeding into the 2015 World Championship later this year. The brackets and standings below are up to date as of Sunday, July 26th and, as always, VODs can be found here. 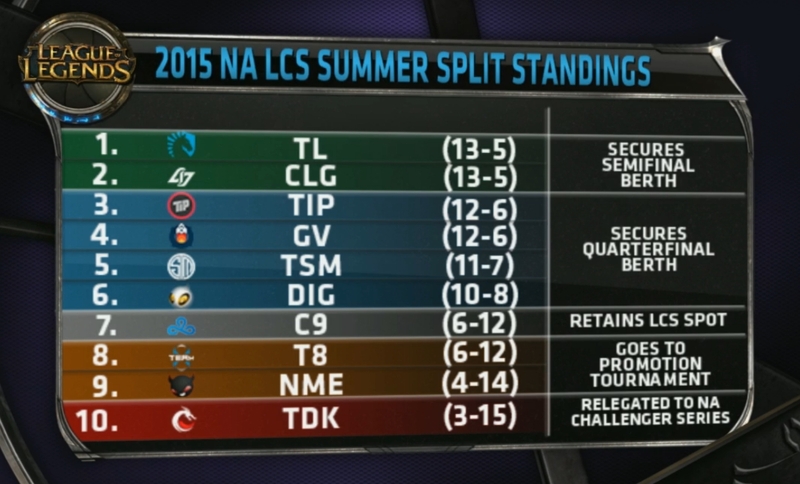 Standings after Week 9 - the final week of the LCS Summer split. Team Liquid and Counter Logic Gaming have secured byes into the Semifinals (August 15th/16th) by placing 1st and 2nd. Team Impulse, Gravity, Team Solomid, and Dignitas have secured Quarterfinals slots (August 8th/9th) by placing 3rd-6th. C9 retains their LCS spot for next split. T8 and NME head to the promotion tournament to see if they can defend their spot in the spring split and TDK has been relegated down to the Challenger series. The NA LCS action starts back up with the Summer playoffs starting on August 8th, leading up to the finals on August 23rd! 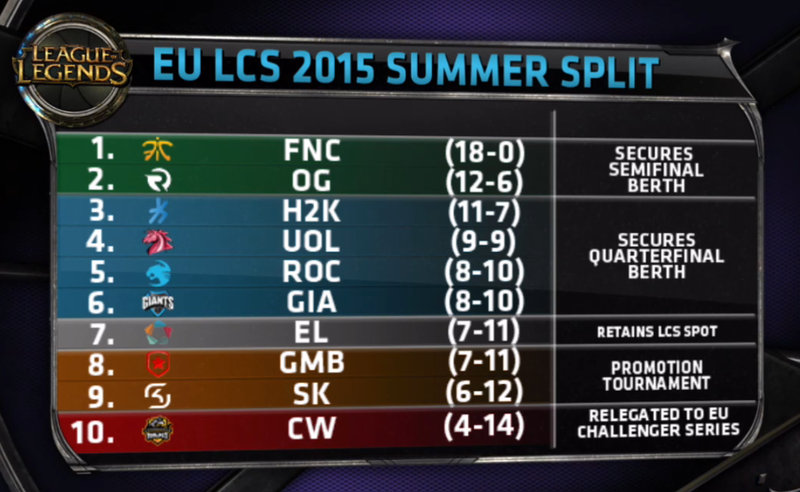 Fnatic and Origen have secured byes into the Semifinals (August 15th/16th) by placing 1st and 2nd. Unicorns of Love, ROCCAT, H2K, and Giants Gaming have secured Quarterfinals slots (August 8th/9th) by placing 3rd-6th. EL retains their LCS spot for next split. GMB and SK Gaming head to the promotion tournament to see if they can defend their spot in the spring split and CW has been relegated down to the Challenger series. The EU LCS action starts back up with the Summer playoffs starting on August 8th, leading up to the finals on August 23rd! Playoffs begin on August 4th with the Semifinals. Finals will be held on August 12th! The top team from the playoffs earns an 2016 NA LCS Spring spot while 2nd and 3rd will head to the 2016 NA LCS Spring Promotion tournament! Playoffs begin on August 4th with the Semifinals. Finals will be held on August 12th! The top team from the playoffs earns an 2016 EU LCS Spring spot while 2nd and 3rd will head to the 2016 EU LCS Spring Promotion tournament! Summer Split Playoffs have just finished up in the LMS with AHQ reigning victorious! Team Impulse's starting midlaner XiaoWeiXiao has been confirmed of ELO boosting, and has been suspended pending investigation. Team Impulse's statement on the situation can be found here. An official competitive ruling has been issued upon Gambit Gaming's starting AD Carry FORG1VEN regarding negative in-game behavior and toxicity, and has been suspended for four games. Gambit Gaming's statement on the situation can be found here. Gilius is no longer the starting jungler for Unicorns of Love and is open for NA/EU LCS offers. Following their relegation from the EU LCS, Shook has left Copenhagen Wolves and is now a free agent. Riot has also published a feature video on the three Danish NA LCS players - Trashy from NME, Bjergsen from TSM, and Santorin from TSM.